On Fri 4/11 and Sat 4/12, two festivals are happening in town, both featuring a massive lineups of local underground rock. 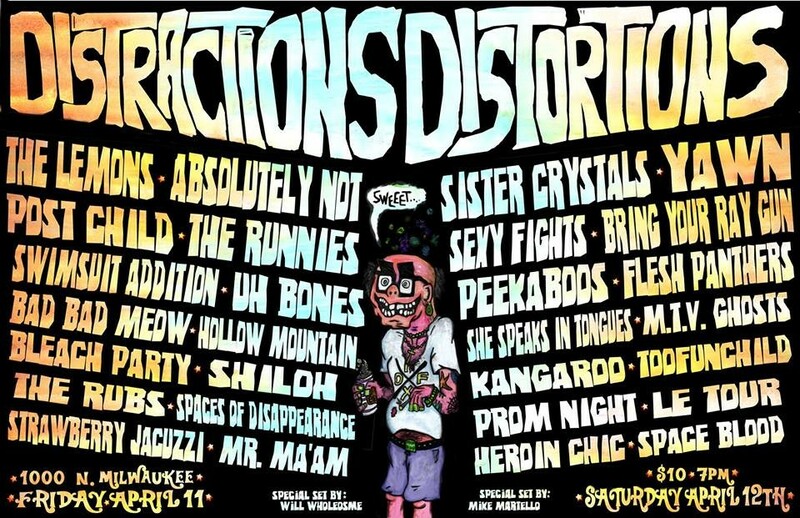 First up there's the Distractions Distortions fest (mentioned in this week's Gossip Wolf) at Multikulti in Noble Square. It's leaning more to the punk and garage-rock end of the spectrum, with 30 acts across both days. Friday's show is headlined by lo-fi pop group the Lemons, and the fourteen openers include Absolutely Not, the Runnies, Post Child, Swimsuit Addition, Hollow Mountain, and others. On Saturday, dream poppers Yawn close the night out, and some of their support acts are Sister Crystals, Flesh Panthers, and MTVghosts. The fest promises to have the bands playing on two stages in "rapid succession" for a nonstop party vibe. Things kick off at 7 PM on both nights, and tickets for $10 per day. There's even a limited amount of free beer for early arrivals. And in Logan Square the Burlington is hosting Slippery Kingdom Fest, which focuses on the heavy and the weird. Six bands play each night, with Friday night headlined by brand-new Disappears and Ant'lrd side project Cities of the Interior. The Sueves, Vlllage, and Melkbelly are some of the other bands playing that night. On Saturday, heavy thrash band Wizard Castle closes out with the fest, with support from Cokegoat, Dragon Feeder, and others. Music kicks off at 8 PM on both nights, and admission is $8 a day. Slippery Kingdom also offers a T-shirt and advance ticket combo pack that you can order online. Both festivals are 21 and up.